We bought this cutest Fisher Price First Dollhouse for Christmas two years ago, but we thought she won’t play with it until she gets bigger because she was only 18 months old then. We were wrong. She loved it and had endless hours of fun with this. And she still has. She loved it from the moment we took it out of the box. So, from my experience, this first dollhouse is also perfect for girls (or boys) younger than two years. There are no small parts that would be dangerous for a younger child, so no worries there. Also, some additional sets can be purchased top. I highly recommend the big sister set, as it comes with an additional family member, and a bed, which the dollhouse is lacking in. Also, the grandma/stroller set would be another solid choice. 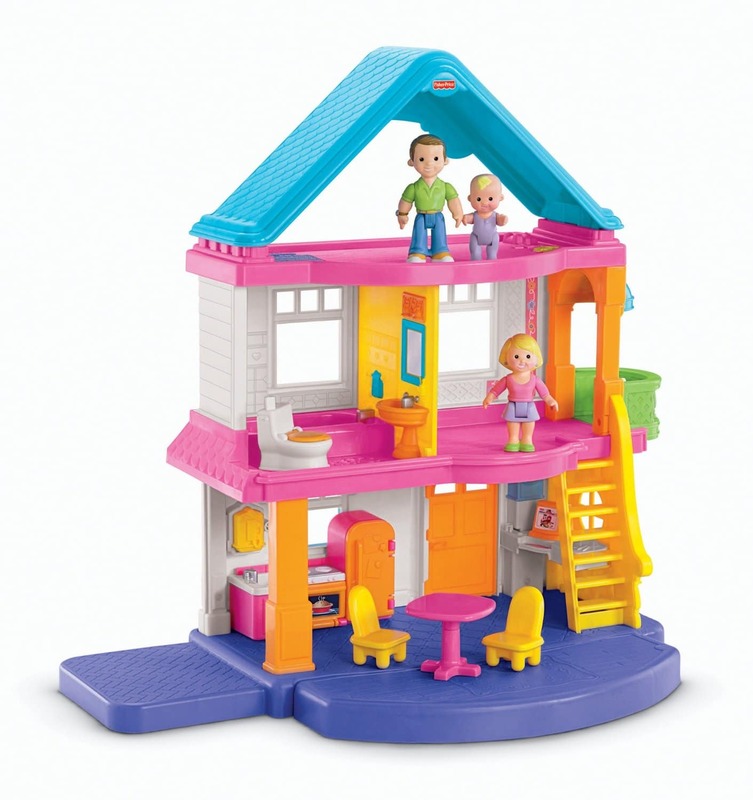 Walk through the front door and experience three stories of fun and imagination with mommy, daddy and baby in the Fisher-Price My First Dollhouse! There are several accessories and lots of room, with plenty of nurturing play in store for your little one! Each family member is sized just-right for little hands to hold. Who’s making dinner in the kitchen? Is that baby sitting at the table? Watch your little one’s imagination soar to new heights as she learns through role-play with the Fisher-Price My First Dollhouse!. Dollhouse has five different rooms and includes mom, dad and baby figures. It comes with a kitchen set, chairs and table, and a bathroom which includes built in tub and sink and a separate toilet. It’s a shame it doesn’t have a bedroom, but it’s still very good. Only bad thing I heard is that the people and furniture pieces that come with this product as additional pieces have been discontinued. And according to Fisher Price, other furniture for the Loving Family dollhouse will not fit this product. That’s such a shame. But, I read some additional sets can still be purchased, like big sister set or grandma set. We didn’t buy additional sets because I like the fact that there are only a few pieces included so don’t have to track the toys all around the house. She still uses some of her other dolls to play with the house. She loves playing with the “family”. They eat at the table, take baths, go potty, play outside, etc. The best thing about this dollhouse is a great price. I was looking for some other dollhouses too and they were much more expensive than this one. The small price doesn’t mean it’s not well made. I can say it is a really good quality! This is definitely a great gift for a 2 year old toddler and I will definitely buy if for our little friends’ upcoming birthdays! The dolls and furniture that come with it are the perfect size for her little hands. For me, this is the perfect dollhouse and now when I know that she loves to play with this, I can think of buying an improved version of the dollhouse. But that is for some other dollhouse review. to buy the product on Amazon. For such a good price, this toy is a great investment. Most children are drawn to this dollhouse and it will provide endless hours of fun. It’s a great starter and the price is extremely fair for what is provided. *And just for full disclosure, there are affiliate links in this Dollhouse review. This means that I’m sharing something that I think is helpful, and if you make a purchase through the link, I earn a little bit back. No extra cost to you, and just a little help for me to pay for the blog expenses. I bought this one for my niece and she is in love with it. Great choice for toddlers! I would love to purchase additional pieces of furniture but it seems they are not available . . .